Last week, Seattle attorney Chris Davis and Davis Law Group issued a nationwide news release urging boaters to appoint a designated boat driver for the ever-popular Seafair weekend in Seattle. 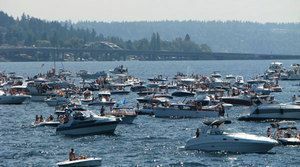 Although there were a significant number of irresponsible and impaired drivers on boats on the water during Seafair, the Mercer Island Police Department (MIPD) says the overall statistics were positive. The department cited a total of 66 boaters for Boating Under the Influence (BUI) this year, fewer than the total in 2011. Burns said the department was actively keeping an eye out for boats that were overloaded with passengers or driving erratically. Boaters can be cited for BUI if their blood-alcohol content is above .08, the same threshold for motor vehicles on roadways. “I don’t think that [people] realize that there’s the same threshold for operating a boat that we have for operating a vehicle on a roadway,” Burns added. She said many times boaters are surprised to learn they can be arrested for BUI. Davis Law Group helps impaired driving collision victims get financial compensation for their injuries and lost wages. We work closely with the criminal prosecutor to make sure that all avenues, both criminal and civil, are being pursued. If you have been the victim of a drunk driver, contact the drunk driving accident attorneys at Davis Law Group at 206-727-4000.